Add a touch of the forest to your décor with the Ancient Graffiti Flamed Copper Five Panel Tree Disc Wall Art. A barren tree figure adorns each of these five, 4.5" diameter discs, celebrating the changing of the seasons in an elegant way. Beaded chain connects the discs, creating a remarkable, 36" long sculpture. The copper and brown hues throughout the steel unit further the natural look, and this finish may oxidize over time for a dynamic, changing effect. A hook at the top of the artwork allows you to hang it from a nail, while triangular brackets on the back of each disc offer extra securing options. The steel construction ensures a lasting item, which looks equally fantastic outside or indoors. 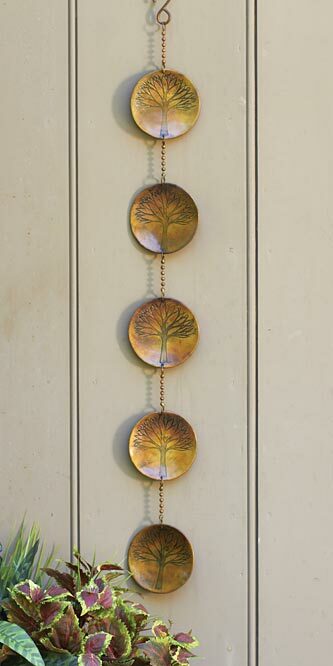 Highlight the natural theme of your home with this Flamed Copper Five Panel Tree Disc Wall Art.